What is meant by Harmful Practices? Harmful traditional practices are forms of violence which have been committed, primarily against women and girls, in certain communities and societies for so long that they are considered, or presented by perpetrators, as part of accepted cultural practice. They have often been embedded in communities for a long time and are born out of community pressure. female genital mutilation or cutting (FGM). In arranged marriages, the families of both spouses take a leading role in arranging the marriage but the choice of whether or not to accept the arrangement remains with the prospective spouses. This is significantly different to an arranged marriage. A forced marriage is where one or both people do not (or in cases of people with learning disabilities or reduced capacity, cannot) consent to the marriage but they are pressurised, or forced to do so. It is recognised in the UK as a form of domestic or child abuse and a serious abuse of human rights. However unlike ‘typical’ domestic abuse, family members and the extended family are often involved. Financial abuse, for example taking someone’s wages. Reasons for performing forced marriages include: strengthening extended family links; controlling unwanted behavior and sexuality; preventing ‘unsuitable’ relationships; protecting and abiding by perceived cultural or religious norms; keeping the wealth in the extended family; dealing with the consequences of pregnancy out of wedlock; considering the contracting of a marriage as the duty of the parents; obtaining a guarantee against poverty; aiding immigration. So called ‘honour’ based violence (HBV) is where the person is being punished by their family or their community. They are being punished because of a belief, actual or alleged, that a person has not been properly controlled enough to conformity and thus this is to the ‘shame’ or ‘dishonour’ of the family. ‘Honour Based Violence’ is a crime or incident, which has or may have been committed to protect or defend the honour of the family and/or community members (ACPO 2007). The Anti-social Behaviour, Crime and Policing Act 2014 made it a criminal offence in England, Wales and Scotland to force someone to marry. 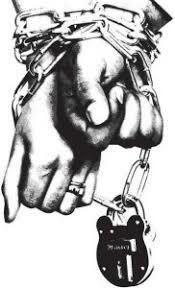 It is also possible for victims or those at risk to apply for a Forced Marriage Protection Order (FMPO). As a civil law measure, an application for a FMPO would be made in the family court. In 2017 the government introduced lifelong anonymity for victims of forced marriage to encourage more victims of this hidden crime to come forward. 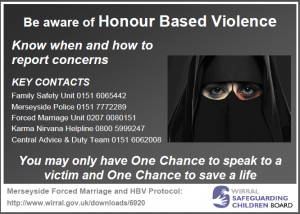 All practitioners working with victims of forced marriage and HBV need to be aware of the ‘one chance’ rule. That is, they may only have one chance to speak to a potential victim and may only have one chance to save a life. All practitioners working within statutory agencies need to be aware of their responsibilities and obligations when they become aware of potential forced marriage/ HBV cases. If the victim is allowed to walk out the door without support being offered, that one chance might be wasted. It is important to remember that in these instances family members, friends and the community may pose the biggest risk to the victim. Across 28 countries in Africa and the Middle East, over 200 million women and girls have been subjected to some form of genital mutilation. The Serious Crime Act 2015 (guide) extends this protection to girls under the age of 18 who are ‘habitually resident’ (or on short temporary stays) such as students and refugees. The Serious Crime Act also creates a new offence of failing to protect a girl from FGM. 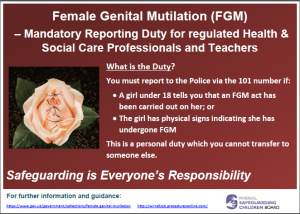 If an offence of FGM is committed against a girl under the age of 16, each person who is responsible for the girl at the time the FGM occurred will be liable under this new offence. The 2015 Act also enables the high court or family courts to make a FGM Protection Order for individuals who are victims or at risk of FGM (similar to forced marriage protection orders). Victims or those at risk, or relevant third parties (including local authorities) can apply for the orders which set restrictions to protect an individual. 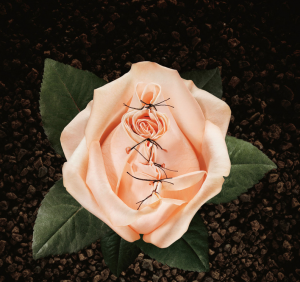 FGM is a form of child abuse and violence against women and girls, and therefore should be dealt with as part of existing child and adult protection structures, policies and procedures. The definition, which is commonly accepted across faith-based organisations, non-governmental organisations and the public sector, is the term ‘possession by evil spirits’ or ‘witchcraft’. All agencies should be alert to the indicators above and should be able to identify children at risk of this type of abuse and intervene to prevent it by using the procedures for Referrals, Social Work Assessment of Needs and Strengths and, when appropriate, Strategy Discussions/Meetings. All referrals must be responded by Children’s Specialist Services with a thorough Social Work Assessment of Needs and Strengths and, depending on the seriousness of the referral information, a Strategy Discussion which takes into account the dimension of the beliefs expressed by the child and family. The assessment must involve the particular faith group or person performing or advising the family about the child in order to establish the facts i.e. what is happening to the child. A discussion should take place with the Safeguarding Unit in all cases where there are accusations of ‘possession’ or ‘witchcraft’. Any suggestions that the parent or carers will take the child out of the country must be taken seriously and legal advice sought regarding possible prevention. See also Pan Merseyside Missing From Home multi-agency protocol. Further contacts for advice can be found from the local representatives for some faiths, from organisations such as the Churches’ Child Protection Advisory Service (CCPAS) who provide information about exorcism; the African Caribbean Evangelical Alliance (ACEA); Churches Together in England and the Muslim Parliament, all of whom are consulting about and developing guidance. The Local Authority Safeguarding Unit will collate information and keep the LSCB updated when necessary so that liaison and communication with local faith groups can be monitored and developed. Savera UK help people experiencing domestic abuse, or who are at risk of forced marriage, honour killing or female genital mutilation. Karma Nirvana have been supporting victims of honour crimes and forced marriages since 1993. Lines are open between 9.30 am – 5.00 pm. Charity for children and young people who are at risk or subject to honour based crimes/ forced marriages.